1. Will it look good on me? When Jennifer Aniston traded in her long locks for an asymmetrical bob, she catapulted into a new category of chic and women around the country dashed to salons to copy her new style. After all, who doesn’t want to look like a star? But what looks great on a glossy magazine cover may not flatter you. A haircut needs to complement your face shape, bone structure and even the way you carry yourself. Women see a celebrity’s hairstyle and they want to relate, even if it doesn’t work on them. A haircut should flatter your best assets while downplaying your least favorite features. If the look you crave isn’t ideal for you, a good stylist can incorporate certain elements of the cut, tailoring a modified style to your face. We always believe in customizing the haircut to fit the client and always train our team to do the same. 2. What are your credentials? All hairdressers have a state license showing completion of cosmetology school. To go above and beyond, they can earn advanced training certificates, which show they’ve taken continuing education classes throughout the year. When your stylist takes continuing education courses shows a stylist is serious about the craft. 3. Is it a hard style to maintain? That layered bob might look great when your stylist styles it but do you have the hour that it takes you to style it in the mornings? Whether you’re a mom on the go or a beauty junkie willing to devote hours to your tresses, tell your stylist how much time you’re willing to put into styling it. You can also ask for a versatile cut – one that looks stunning when vamped up with a curling iron but that will also look good when you can only manage a quick shampoo. 4. How do I style it? 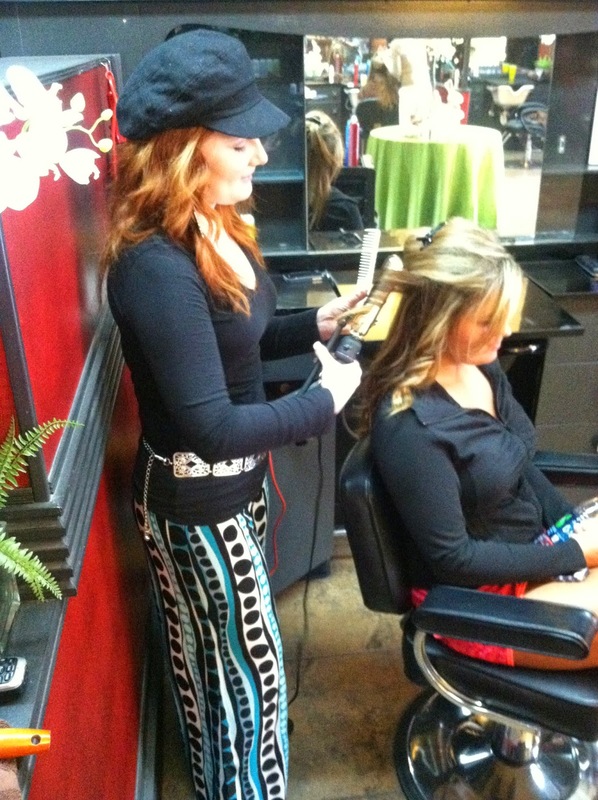 Ask your stylist for a hands-on styling lesson before you leave the salon. Stylists can see angles of your locks that you can’t. We’ve had clients who think they’re blow-drying their hair but are really hitting the wall behind them. When considering a new style, always keep your hair’s texture in mind. If you want a haircut that looks best styled straight and you have curly hair, be prepared to use a flat iron every day. Ask your stylist to show you how. Another do-it-yourself tip: If you want to look great, learn how to use a round brush and a blow-dryer. TIP: If you have a great stylist, they will gladly give your tips to take home. If they don’t, Find a new one. 5. How short will it really be? Emphasize this is the final look you want when it’s dry. After all, curly hair that falls to mid-back when wet could be chin-length once dry. Arrive at the salon with your hair in its natural state. That way your stylist can see the movement and natural wave before shampooing. If your stylist starts hacking away, stick up for yourself. Tell him or her to stop before it’s too late. In the end, you’re the one who has to live with your hair, not your stylist. 6. Do I have to buy the products? I’m not one to push every can of hairspray on you…however, if you want to achieve the salon look at home…then you will HAVE to have products. Here is how we look at it. When I’m sick I go to the doctor to trust he will give me what I need to get well…It’s the same concept, when we get a new style it’s our responsibility as a stylist to set you up with the correct products to achieve the same look at home. You might not need every product used but ask your stylist if you could leave with only two products which would they suggest. Do your homework beforehand by scouting out looks in beauty magazines. Even if you can’t find your perfect cut, you’ll see aspects of different styles that you like. Share them with your stylist. Also, come clean about your past: Communicate which hairstyles have worked for you and which ones haven’t. You know your hair better than anyone! We at Cowan and Co. always offer FREE haircut consultations. Ask your stylist to come up with some looks they think would be good on you. Keep a clear open communication. If you feel they don’t take enough time in the consultation then chances are it won’t be good.